Provided photo “Words from Within” student editors, left to right, Gabriella Clingman, Mindy Bach, and Kim Kiehl stand in front of artwork created by the late Anne Vacarro. 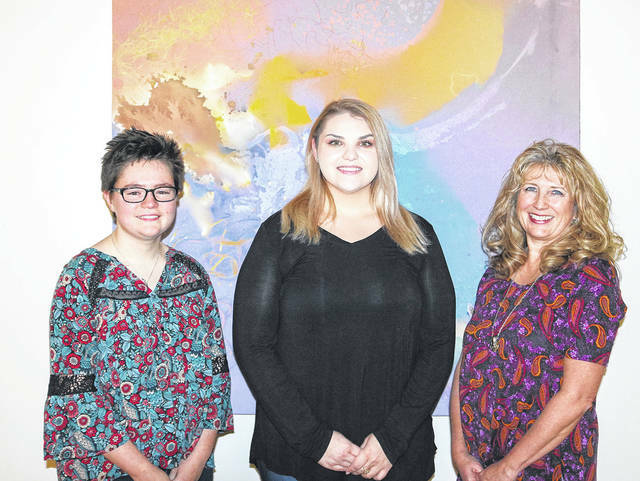 PIQUA — Edison State Community College is pleased to announce the forthcoming publication of “Words from Within” with student editors Gabriella Clingman, of Pleasant Hill; Kim Kiehl, of Piqua; and Mindy Bach, of Tipp City. Published by Genesis Graphics of Troy, the release date is scheduled for Saturday, Dec. 15, 2018. A reception will be held on that date at 10 a.m. at the East Hall Art Gallery at Edison State and at that time contributors will be given copies of the magazine and will read poems and excerpts from their stories. Adviser Dr. Vivian Blevins says, “This is truly a student publication. The three editors made all the decisions from naming the publication, to selecting submissions, to editing, to formatting, and to working with the printer. https://www.dailycall.com/wp-content/uploads/sites/30/2018/12/web1_Editors.jpgProvided photo “Words from Within” student editors, left to right, Gabriella Clingman, Mindy Bach, and Kim Kiehl stand in front of artwork created by the late Anne Vacarro.